Massage into damp skin using firm, circular movements, paying particular attention to dry areas. Rinse away with warm water. 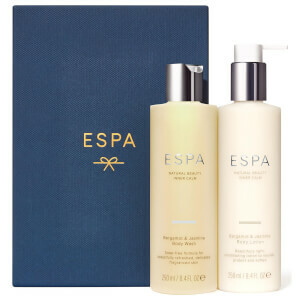 Follow with your favourite ESPA body moisturizer or body oil. Water (Aqua), Sodium Lauryl Sulfoacetate, Hydrogenated Rapeseed Oil, Coco-Glucoside, Polysorbate 20, Sodium Chloride, Sclerotium Gum, Juglans Regia (Walnut) Shell Powder, Rosa Canina Seed Powder, Sucrose Cocoate, Sodium Cocoyl Alaninate, Hectorite, Oryza Sativa (Rice) Hull Powder, Sodium Sulfate, Argania Spinosa Kernel Oil, Yucca Schidigera Stem Extract, Phenoxyethanol, Caprylyl Glycol, Aniba Rosodora (Rosewood) Wood Oil, Linalool, Cananga Odorata Flower Oil, Citrus Aurantium Bergamia (Bergamot) Fruit Oil, Lavandula Angustifolia (Lavender) Oil, Lonicera Caprifolium (Honeysuckle) Flower Extract, Lonicera Japonica (Honeysuckle) Flower Extract, Limonene, Citrus Nobilis (Mandarin Orange) Peel Oil, Coriandrum Sativum (Coriander) Fruit Oil, Eugenia Caryophyllus (Clove) Bud Oil, Pelargonium Graveolens Oil, Pogostemon Cablin Leaf Oil, Eugenol, Acacia Decurrens Flower Extract, Jasminum Officinale (Jasmine) Flower Extract, Salvia Sclarea (Clary) Oil, Phytic Acid, Geraniol, Citronellol, Benzyl Benzoate, Cistus Ladaniferus Resin, Citrus Aurantifolia (Lime) Oil, Ferula Galbaniflua (Galbanum) Resin Oil, Illicium Verum (Anise) Fruit/Seed Oil, Opoponax Oil, Rosa Damascena Flower Extract, Santalum Album (Sandalwood) Oil, Zingiber Officinale (Ginger) Root Oil, Sodium Benzoate, Citric Acid. Definitely gorgeous! Lovely subtle scent and very good at gently exfoliating my body, without leaving me feeling scrubbed raw.Hope this product reappears in my bathroom many times! Delightful product! I will definitely buy this item again as it has a lovely fragrance, great texture and does exactly what it says. I first bought this product (when the ingredients were slightly different) and used it on holiday. It's become my 'holiday' shower gel as I tend to buy a tube each year just for holidays! I look forward to using it and love the smell it leaves on my skin and in the bathroom. Whenever I do use it at home, it reminds me instantly of holidays. My skin always feels soft and nourished after using this - I love it ! I have been using the Body Smoothing Shower Gel for a number of years and it is an excellent and very effective product, it does exfoliate really well without causing any irritation and smells divine too! Excellent customer service. Offered free samples. None arrived with products pruchased, raised the issue via email and then social media with no response after two weeks. Very disappointed. Elemis meanwhile provided an excellent choice of free samples and delivered very quickly. Perhaps Espa should take a leaf out of their book. It's often difficult to get this out the tube at the start and end of each tube. Not sure if there is anything which can be done to make it easier?